3D printed plastic house will be assembled "in a day"
News: London architecture collective Softkill Design has joined the race to build the world's first 3D printed house, announcing plans for a plastic dwelling that could be built off-site in three weeks and assembled in a single day. "It will hopefully be the first actual 3D printed house on site," said Gilles Retsin of Softkill Design. "We are hoping to have the first prototype out in the summer." Update: read the full interview with Retsin about 3D-printed architecture. The single-storey Protohouse 2.0 will be eight metres wide and four metres long and will be printed in sections in a factory. The parts will be small enough to be transported in vans and then snapped together on site. "It would take up to three weeks to have all the pieces fabricated," said Retsin. "Assembly on site is a one-day job, if the site is prepared before hand." "You don't need any bolting, screwing, or welding on site," he added. "Imagine a Velcro or button-like connection. The pieces are extremely light, and they just kind of click together so you don't need any other material." A rival 3D printed house project by Dutch studio Universe Architecture was announced earlier this year, but Gilles dismissed its claims. "We actually don't even consider that a 3D printed building because he is 3D printing formwork and then pouring concrete into the form," Retsin said. "So it's not that the actual building is 3D printed." Softkill Design's proposal is a development of Protohouse 1.0 (shown here), an earlier prototype printed house unveiled at the 3D Print Show in London last October. Instead of solid walls, the original Protohouse featured a fibrous nylon structure based on bone growth. The organic, fibrous form of the prototype led Dezeen readers to compare it to "a dinosaur head made of spaghetti" and "a giant spider cave". Protohouse 2.0 takes the same approach, with plastic material deposited only where it is needed. "You're aiming to use the smallest amount of material to achieve the strongest structure," Retsin explained. And if you push that through to the extreme you get something that is extremely fibrous and extremely thin." Components for the Protohouse 2.0 will be fabricated in laser-sintered bioplastic at existing 3D printing facilities. This method provides better quality and structural integrity than printing on site using traditional materials such as sand or concrete, Retsin believes. "The printers that you use on site can only print and build something vertically," he said. "So they put one layer on one layer and build up the structure vertically whereas if you print off site you're not operating in that vertical extreme, so you have much more design freedom." "These highly fibrous structures are only 0.7 millimetres thick," he added. "It's impossible to print those with stone, because there's not enough structure or strength or integrity in sand. In the factory environment you can go into stronger materials like plastics or metals." The build cost of the Protohouse 2.0 is confidential, but Retsin said: "The cost balance of material, time, and logistics in a growing industry means the cost of the Protohouse could be a viable competitor to traditional means of manufacture and build in the relatively near future." In an earlier conversation, Retsin's colleague Aaron Silver told Dezeen that the trend for 3D-printed building is likely to continue. "I think there really is an interesting future for architecture and 3D printing," he said. "You have great cost savings, material efficiency, things like that, which architects are vastly interested in." See more stories about 3D printing, including our interview with Universe Architecture's Janjaap Ruijssenaars. 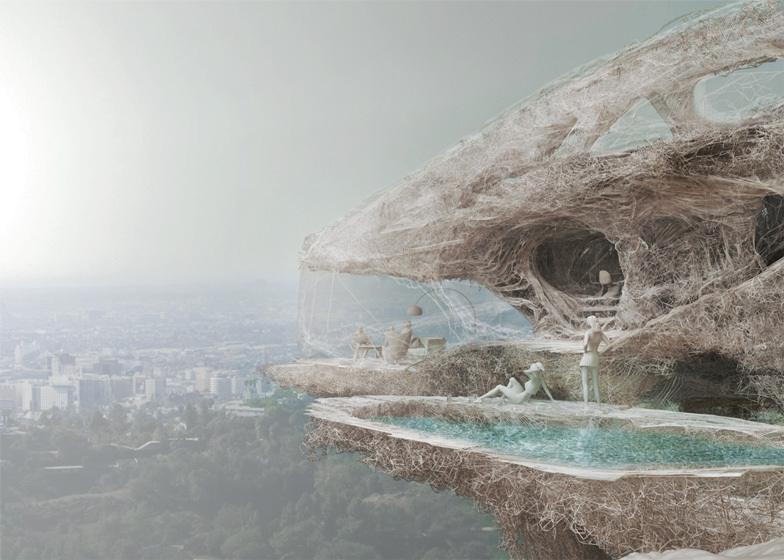 Softkill Design, a London based design collective, is working on a second, market-friendly version of the Protohouse. The Protohouse 1.0 was developed as a research project at the Architectural Association's Design Research Lab, Robert Stuart Smith Studio, and was supported by Materialise. The project is the first to prototype an entirely 3d printed building, including facade, curtains and finishes. Softkill's main objective is to move away from the heavy, compression based printing of on-site buildings, instead proposing lightweight, high-resolution, optimized structures which, at life scale, are manageable truck-sized pieces that can be printed off site and later assembled on site. Building upon the previous research, the new Protohouse 2.0 is an entirely 3d printed, one-storey, 4x 8m building. It consists of 7 big chunks of laser-sintered plastic, which can be transported to site in a small van. On site, the chunks are designed for assembly and can be fitted without screws or adhesive material within half a day. The hard building structure of the chunks continuously transitions into 3d printed curtain-like material. In contrast to existing precedents in 3d printing buildings, which all make use of sand or concrete, Softkill has focused it's research on lightweight materials such as bio-plastics. This generates buildings with a previously unseen level of detail, and opens up the possibility of printing all architectural elements, such as structure, furniture, stairs and facade, in one instance. Instead of building on-site, where there is always the need of a 3d printer larger than the actual building, Softkill's Protohouse is manufactured off-site in a factory environment with highly precise and fast 3d printers. A consistent tectonic strategy of part-to-whole is embedded in the design process from the very beginning. To harness the possibilities of high-resolution 3d printing, Softkill Design developed a set of algorithms which, similar to bone growth, are able to distribute material where it is needed most. This results in a materially efficient fibrous structure which is at the same time highly intricate and has an ornamental quality. Using the algorithms, Softkill can design the micro-organisation of the material, up to the scale of 0.7 mm.